Services are scheduled for 10 a.m. Wednesday, Sept. 5, at St. Anthony’s Catholic Church for Ernesto M. Soto of Lake Arthur. 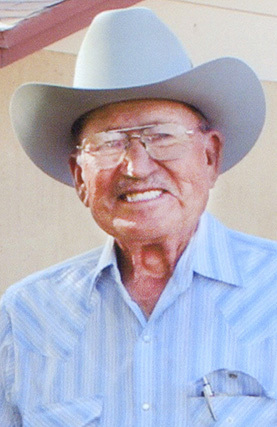 Soto, 86, passed away Wednesday, Aug. 29, 2018, at his home. Fr. Francis Lazer will officiate the services, with interment to follow at Woodbine Cemetery. Pallbearers will be Freddie Soto Jr., Saige Soto, Francisco Grado Jr., Edward Rubio, Robbie Robinson and Jimmy Grado. Honorary pallbearers are Delbert Robinson, C.E. LaRue and Francisco Grado Sr.
Visitation will begin at 10 a.m. Tuesday at Terpening & Son Mortuary. A rosary will be recited at 7 p.m. Tuesday at St. Anthony’s. Ernesto was born Feb. 26, 1932, in San Francisco de Arriba, Mexico, to Trinidad and Gabriella (Macias) Soto. In June 1958, he married Maria Cruz Grado in Carlsbad. Ernesto was a farm laborer and did several jobs as a mechanic. He was a member of Our Lady of Guadalupe Catholic Church in Lake Arthur and enjoyed hunting and travelling. He was a hard worker and was very well-liked by his peers. His love was spending time with his family and grandchildren. Survivors include sons Juan Ernesto Soto of Juarez, Mexico, Francisco Soto, Roberto Soto, and Richard Soto and wife Sonya, all of Artesia, and Federico Soto and wife Joann of Dexter; special companion Maria Corral; sisters Emilia Montoya of Brownsville, Texas, and Josephina Tovar and Juana Soto, both of Mexico; brother Pedro Soto of Tyler, Texas; 10 grandchildren; and six great-grandchildren. He was preceded in death by his wife, Maria Soto, on Sept. 14, 2002; his parents; and a grandson, Michael Soto.